Article of the newspaper ‘Saarbrücker Zeitung’ of 13th November 2018. Article of the newspaper ‘Saarbrücker Zeitung’ of 24th Juli 2018. Article of the newspaper “Die Woch” of 19th Juli 2018. Article of the newspaper ‘Saarbrücker Zeitung’ of 16th Juli 2018. Article of the newspaper ‘Saarbrücker Zeitung’ of 6th Juli 2018. Article of the newspaper ‘Saarbrücker Zeitung’ of 3rd Juli 2018. Article of the newspaper ‘Saarbrücker Zeitung’ of 12th June 2018. Article of the newspaper ‘Saarbrücker Zeitung’ of 6th December 2017. Article of the newspaper ‘Saarzeitung’ of 21th November 2017. Article of the newspaper ‘Saarbrücker Zeitung’ of 15th October 2017. Article of the newspaper ‘Saarbrücker Zeitung’ of 6th August 2017. Automatik – oder doch lieber von Hand aufziehen? Article of the newspaper ‘Saarbrücker Zeitung’ of 30th November 2016. Article of the newspaper ‘Saarbrücker Zeitung’ of 16th November 2016. Bericht im Öffentlichen Anzeiger der Stadt Püttlingen vom 4. August 2016. Artikel von Dagmar Scholle im Kulturmagazin “OPUS” Juli/August 2016 Heft-Nr. 56. Article of the newspaper ‘Saarbrücker Zeitung’ of 19th March 2016. Article of the newspaper ‘Saarbrücker Zeitung’ of 18th September 2015. Article of the newspaper ‘Saarbrücker Zeitung’ of 19th March 2015. Article of the newspaper ‘Saarbrücker Zeitung’ of 25th August 2014. Article of the newspaper ‘aufsteigen’ of August 2014. Preliminary report on the International Day of Museum 2014 in the Saarbrücker Zeitung of 13th May 2014. 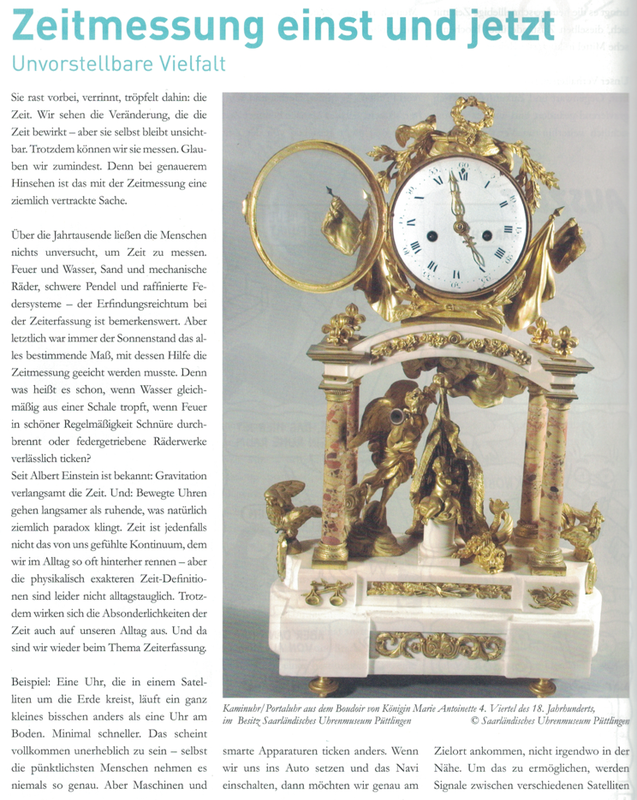 Article on the Clock Museum in the Köllertalmagazin of May 2014. 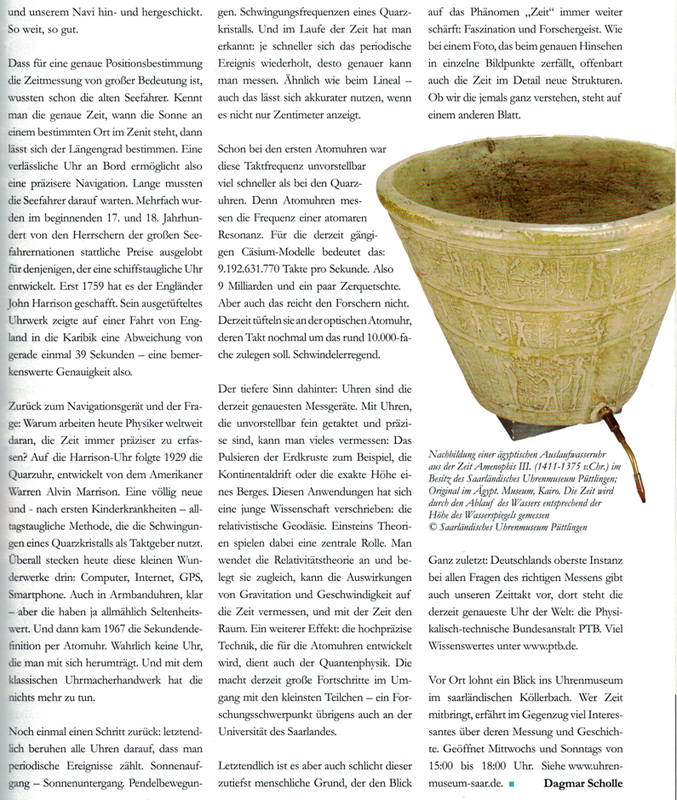 Article of a cultural walk in Püttlingen published in ‘Saarbrücker Zeitung’ of 11th April 2014. Article of 21st November 2013 in the newspaper ‘Républicain Lorrain’. Article of a rally in the newspaper ‘Wochenspiegel’ of 26th July 2013. Article in the newspaper ‘Saarbrücker Zeitung’ of 11th May 2013. Article in the newspaper ‘Saarbrücker Zeitung’ of 13th April 2013. Article in the newspaper ‘Saarbrücker Zeitung’ of 20th anniversary of the ‘Saarländisches Uhrenmuseum’ of 10th November 2012. Article in the newspaper ‘Saarbrücker Zeitung’ of the exhibition of elementary watches of 31rst July 2012. Article of the newspaper ‘Saarbrücker Zeitung’ of 22nd March 2012. Article of the newspaper ‘Saarbrücker Zeitung’ of 19th July 2011. Article in the newspaper ‘Saarbrücker Zeitung’ of 24th November 2009.